Strong, Intelligent, and Gorgeous. People forgive him much because of his incredible good looks and karizma. He’s a natural leader. He governs relationships and keeps a watchful eye on finances. VI The Lovers – Romance, when two become one. They have no use for the rest of the world, except as witnesses. He loved travel and derived great enjoyment out of playing games and tricks. The Thief, thief of what though? Hearts?? He feels like a victim. He was beaten by the game, now he feels scorned and ridiculed by those who once loved him. They both, The Emperor and the 1 of Cups are feeling the heat. He say, If the truth hurts, or if you can’t handle this truth, feel free to take a flying leap. A woman unskilled in this kind of love yet he finds her most desirable. He wants to instruct her as he sees in her great potential. Prince (The Emperor) is still full of himself despite the events of the resent past. He was more than a little shaken (The Tower) and is acknowledging that she (1oC) has been hurt too. He says this will not always be easy. (The Chariot) He knows that she’s lost a lot over this. (The Tower) That people have “jumped ship”. He knows what’s being said and by whom, but he will not be detoured. He speaks of the woman again, he likes her, has romantic feelings toward her. He likes playing tricks on her, moving things. (VIIoS) He steals her stuff and her heart perhaps? He says she’s a mover and a shaker (VIII The Chariot) and that’s not exclusive to the dance floor (The Lovers). He speaks of a deeper kind of love, the kind of love that’s eternal. (1oC) The kind of relationship in which they never stop learn about each other. The Emperor in him is protective of her. He watches over her, protects her, not just physically, he watches over her finances as well. In the center upper third I see, The All Seeing Eye. The pyramid with the eye in the center surrounded by a spray of light that can be found on US currency. The 3 sides of the triangle represent the spirit realm, the physical realm and the connection between the two, the human with the divine . The eye of the divine watches over all of mankind, or in this case the spirit half(The Emperor) of the lovers watches over the human half (1 of Cups). The rays of light represents the spiritual awakening or connection with the universal consciousness. Looks like these two will be connected for a very long time. 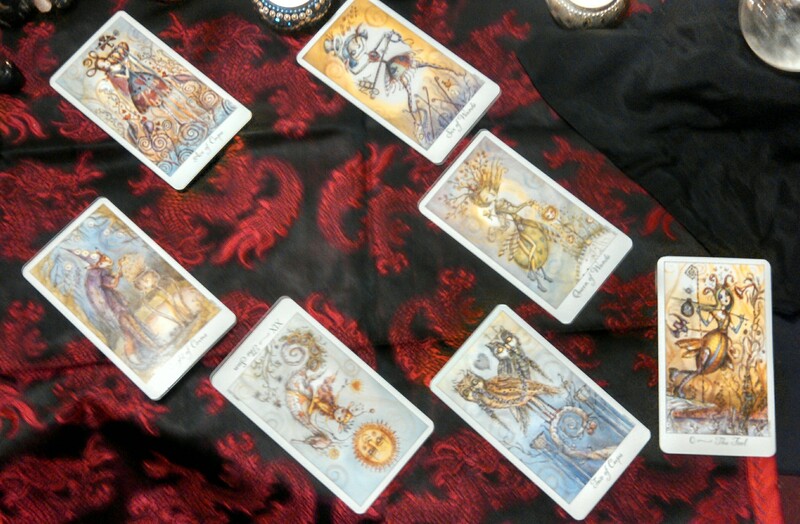 This full reading is available on ello . Stop by and check it out! 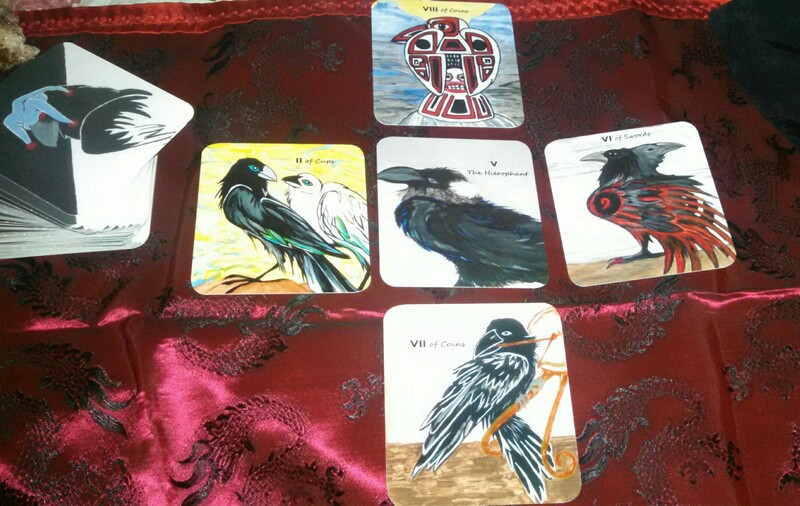 This and other great tarot spreads can be found at mytarotspreads. **I only have two openings left for the month of February, if you would like to fill one of those spots time to act is now! The Fool follows a magical path, and though she travels perilously close to the edge she is never in any real danger. Someone’s always got her back. 1. What does success mean to me(querent)? Success is the suit of Cups is measured in emotion. This Ace’s cup runneth over, not in a monetary sense, but from fullness of heart. This is someone who finds the greatest success, their most notable accomplishment, is nurturing strong, loving relationships. 2. What goal should I(querent) focus on? This card shows a fox, an alchemist creating gold coins in his pot, and hanging them like ornaments from the trees. He’s building on what he’s already learned, perfecting his skills. He’s a wise one this fox. He knows that his dedication and enthusiasm will soon get him noticed. 3. What risk must I(querent) take? 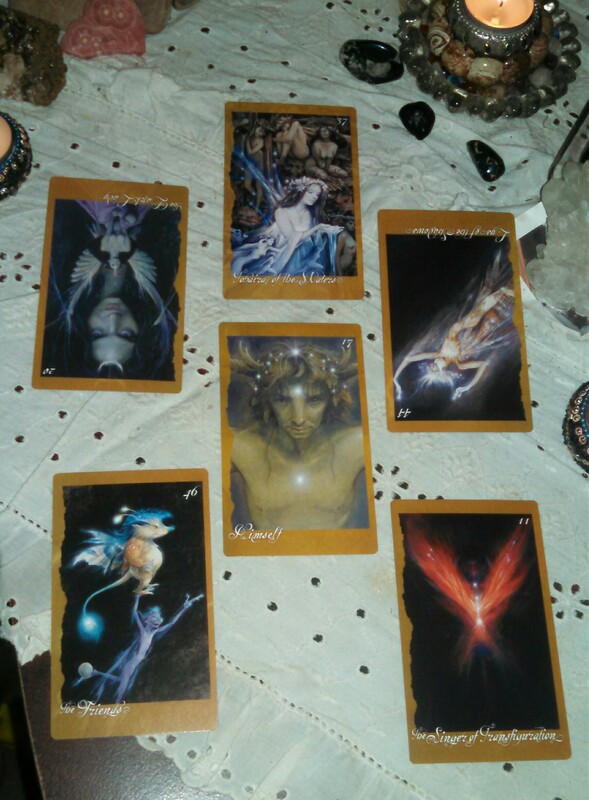 Six is such a happy number, content with where she is, while he suit of Wands is about creating magic. This young magician must dazzle while out on a limb. She must stretch herself, go outside of her comfort zone if she wishes to fulfill her dreams. 4. What must I(querent) let go of? The Sun in it’s upright position is bright, happy and confident. This card shows a seahorse, and it’s rider out on a sunny day, but in reverse our rider is in danger of falling into the sun. 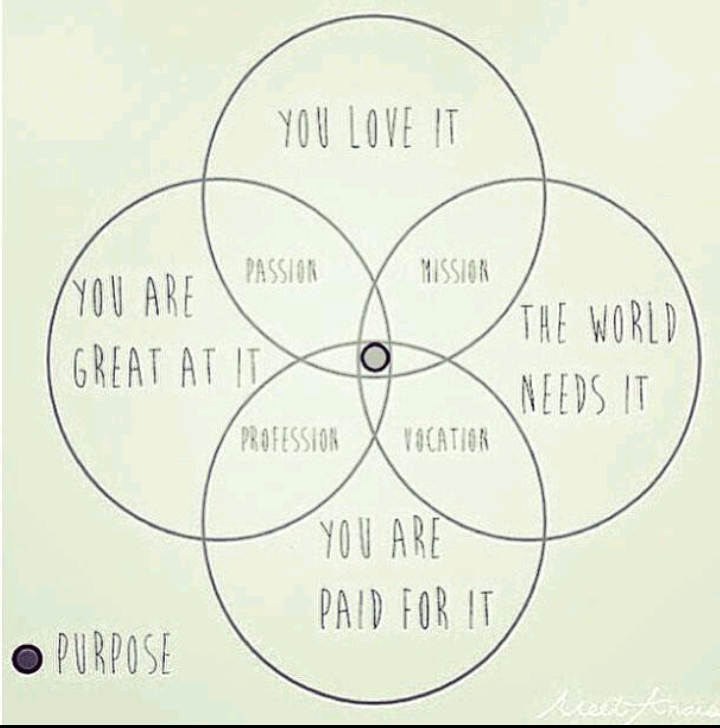 This indicates burnout, someone who put’s others needs before their own. It can also indicate self doubt. Someone who shy’s away from the spotlight, afraid of letting their true nature show. Someone who’s uncomfortable with compliments. 5. What must I bring into my(querents) life? Queens nurture the spirit. They remain committed through challenges, and are committed to detail, but most of all they bring balance to all that they do. 6. What steps must be taken right now? Here we have two owls holding a common thread in their beaks. Their communication flows from the thread overfilling the cups beneath them. This is one of the greatest love cards in tarot. It speaks of a joining or melding of two, and of communication with clarity and truth. Joie de Vivre which translates Exuberant Enjoyment of Life, and The Manifest Success spread compliment each other beautifully. *Another great spread from arcanemysteries. *Follow the discussion about this post at ello. 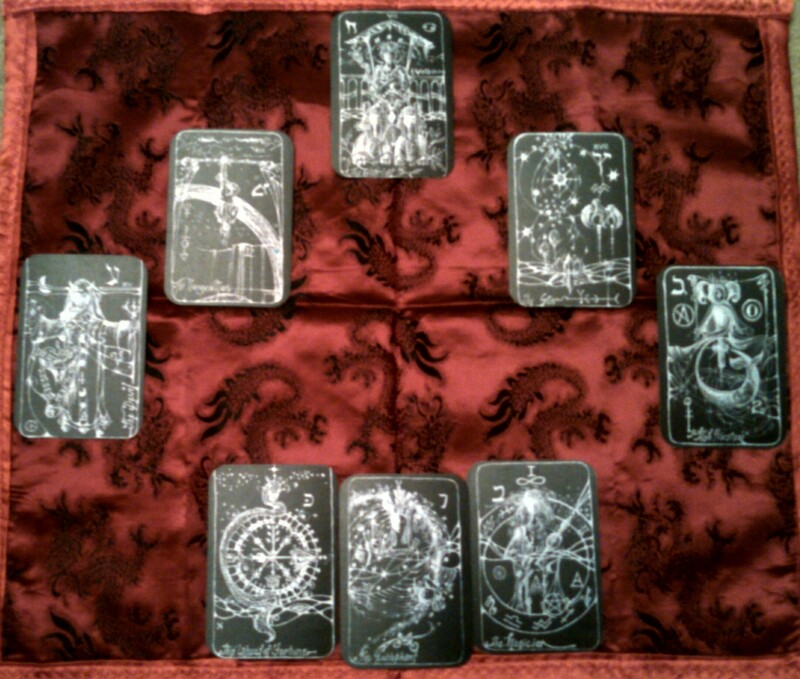 **Private Readings Are Available By Appointment! 1. What Blessings Do The Holidays Hold For Me/You? 2. What has Thrived This Past Year? 3. What What Needs To Be Pruned? 4. What Obstacles Have I/You Faced? 5. How Did I/You Overcome These Obstacles? 6. What Goals Must I/You Put In Place For Myself/Yourself? 7. How Can I/You Nurture My/Your Goals? 8. What Must I/You Focus On To Aid In Growth? Find out about this spread, deck and more at ello.co. *Private Readings Are Now Available! Please message for appointments and pricing. Find the complete reading at https://ello.co/starriknytes. There’s Plenty Of Tarot Going On Here! Come See! 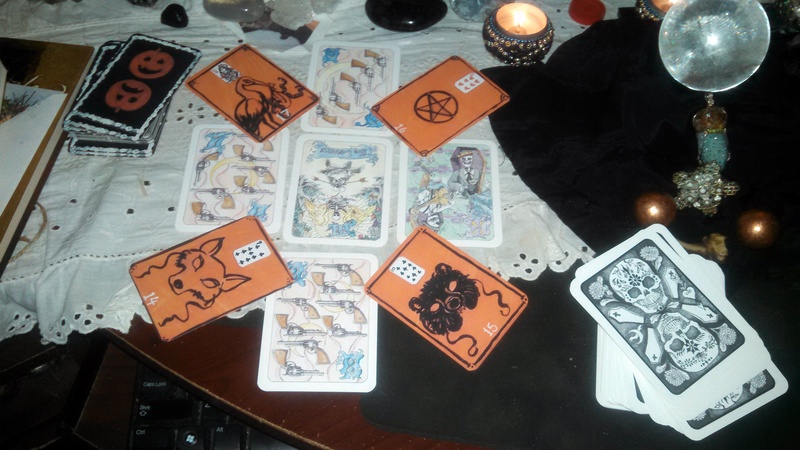 There’s Tarot and More going on at Ello…. Here’s some of what you might see. Come Check Me Out! This was a fun experiment, playing around with an image, Tarot, and Lenormand cards with an interesting result. As you can see I’ve used two of my more holiday themed decks to get into the Halloween spirit, Tarot of the Dead and Haunted Lenormand. 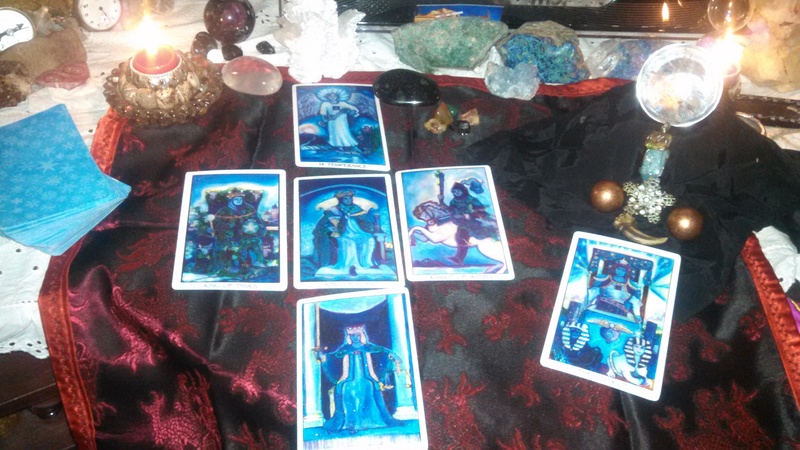 It’s a great time of year to be a tarot reader. The cards were drawn and placed in a common overlapping method. Tarot first with Lenormand on top to simulate the large circles and the overlapping spaces in the top image. In this case the Lenormands card would be used to clarify the tarot card associated the subject matter in the larger circles. The above combination is what worked for me, but there are any number of combinations you might try. Please give it a go. I would love to hear how it works for you. *Uppermost image courtesy of the kids at Tumblr. The Tower speaks of turbulent times and a need for a cleansing or correction. It’s time to build a new foundation. The Empress is a nurturer. This card is about reaching for a dream or ideal, creating something better. This card is about possessiveness, jealousy, lack of trust and the inability to share. This 2 speaks of exciting times and invigorating energy. With all messages from Prince there is an undercurrent of love. The Lovers are tangled up in the love of money. It is that misplaced love that has shaken our foundation to the core. It has destroyed our homes and our relationships. It caused jealousy and distrust among neighbors. It’s caused us to abandon our roots. We need to nurture the energy of transformation. We need to rediscover our personal values, and the value of our relationships, not only with our neighbors but with the earth that sustains us. We need to disentangle ourselves from the superficial aspects of life and get back in tune with the vibration of love. Prince is showing us to not be weighed down by conformity. Those in leadership rolls don’t always have our best interests at heart. We need to see with our hearts and eyes open and live our authentic truth. No compromise, and no regrets. Here Prince shows that our earth is sick. We are stewards of our world. We need to be responsible. We need to nurture and protect. It is our responsibility to return it to its original rich fertile state. It’s what right for the earth and it’s what’s right for earth’s inhabitants.